Nothing revitalizes tired bodies than a few moments spent basking in the morning sun, and what better way to make this ritual a more relaxing experience than to pair it with great tunes that celebrate light itself. With a longing for brightness from living in a country enveloped in darkness for most of the year, Malmö, Sweden-based Emerald Park patterns its sound in praise of musical illumination. Their latest release, GO!GO!GO!, is a breath of fresh air packed with cutting-edge indie pop and uninhibited creativity. Lighthearted. That’s what first comes to mind upon listening to the title track, Go!Go!Go!. Whimsical electro keys that flutter and jump in a rhythmic motion establishes a positive, upbeat mood. The track gets its beauty from its ability to paint dreamy undertones that shed positivity in every play. Pre-released for free download via SoundCloud, LiberTeens is one of the standout tracks in the album in terms of complexity, vibe, and arrangement. Here, the band adds layers over layers of glowing melodies to create an illustrious eclectic arrangement. The amount of detail put into this track, from the two claps after each line to the seamless blend of breathy vocals, are all well-placed to make sure that each element shines while contributing to an organic listening experience. Another pre-release for free download, Wolf juggles between atmospheric and upbeat tunes. The band manages to let the contrast between these two elements play in their favor by letting them balance each other. Listen as the rough, textured edges of animated pop are smoothened out by calming ambient melodies. GO!GO!GO! reminds us that there is still brightness amidst shadows. Listening to these lighthearted anthems gives you a sense of upliftment, making every day a bit brighter. 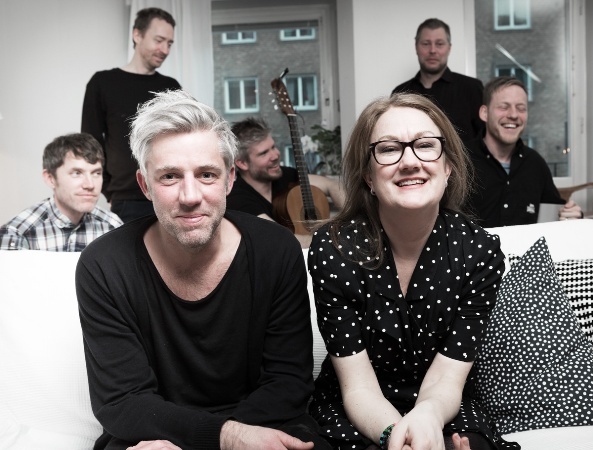 Emerald Park is Martina Johansson, Daniel Jönsson, Conny Fridh, Måns Katsler, Mattias Wilke, Frans Af Schmidt, and Tobias Danielsson Borelius. For this album, the band joined forces with producers Ola Frick of Moonbabies and Carl Granberg (Robyn, Danko Jones) to make a more diverse, eclectic flavor than their previous releases. Don’t miss your chance to be one of the first listeners of this promising collection. The album can be heard via a private SoundCloud or downloading it via digital servicing by logging in at Green Light Go. Many thanks for this review. Cheers from Sweden and 23 Seconds Netlabel!